We are in Fall now... Yesterday, I cleaned out and stored our above-the-ground pool, and started putting leaves into trash bags. First signs of changing season. What will you do on your first day of Fall ? 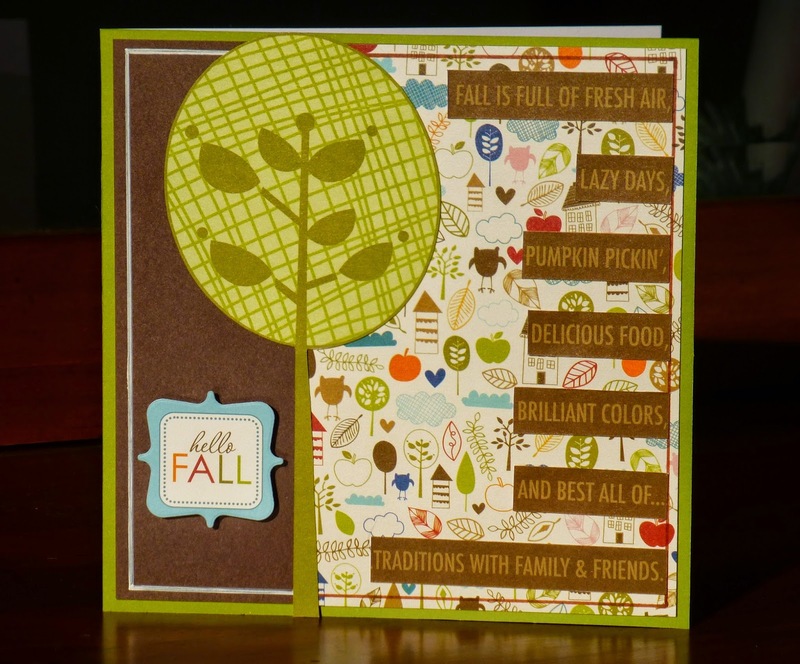 Beautiful fall card, Valerie! I love all of the word/sticker strips along the right side. Our first day of fall is windy, windy, windy and rainy. We went apple picking last weekend though and have already made a batch of applesauce. I may make an apple cake today. I so love fruit picking ! Can you send me a piece of this cake ? We had quite the rain storm overnight, so we're starting off with power outages around town (not us tho). Otherwise its business as usual, our leaves started changing colors a few weeks ago. we are showing signs of fall coming too. can't wait. Love seeing fall creations everywhere. Love the card!! !